The DeWalt DW079KDT rotary laser has everything you need to get all of your layout and leveling work done quickly, accurately and easily. Outfitted with an impressive array of time-saving and productivity-enhancing features including automatic horizontal and vertical leveling, user-friendly controls and easy operability, accuracy to ±1/8 inch per 100 feet, wireless remote controlled operation, and an out-of-level shutoff function that ensures error-free operation and reduces set-up time, the DW079KDT is built to provide highly accurate results while also being easy to set up and operate. The DW079KDT is also equipped with a bright Class IIIa laser beam that's very easy to see under all conditions (visible up to 100 feet indoors and up to 2000 feet outdoors). Engineered for reliable operation in the most demanding conditions, the DW079KDT is very rugged and durable thanks to its heavy-duty housing and protective rotary cage that is very effective in guarding against damage. The DW079KDT is built to perform accurately and reliably day in and day out without fail. You can also operate the DW079KDT all day long as it utilizes DeWalt's exclusive XRP extended run time batteries. DeWalt's XRP Lithium-Ion batteries were designed to provide an increase in run time of up to 40% when compared to standard Ni-Cad batteries. The DeWalt DW079KDT rotary laser is a great value and an asset on any job site. DeWalt is a trusted name in the construction tools market and they have nearly a century of expertise in the industry. 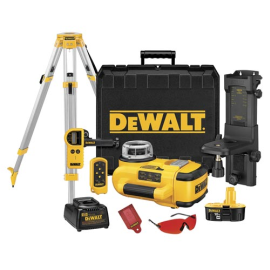 Let DeWalt put their experience and expertise to work for you and see how their tools can improve productivity on your job site while saving you money. If you're looking for a top quality rotary laser that's available at a very affordable price the DW079KDT from DeWalt is an excellent choice. If you don't need the heavy-duty tripod that comes with the DW079KDT package check out the DW079KD rotary laser kit to save a few dollars. Fully automatic horizontal and vertical self leveling. Out-of-level shutoff eliminates user error, ensures accuracy, and reduces set-up time. Private mode option eliminates remote control interference between multiple rotary lasers on the jobsite. Multi-voltage adapter accepts all 9.6V - 18V DeWalt batteries. Protected rotary head and weatherproof design deliver exceptional interior and exterior jobsite durability. Digital laser detector extends interior and exterior range to 600'. Accuracy per 100 ft: 1/8"
New and used DeWalt DW079KDT rotary lasers available on eBay.